Peel the beets and place them in the oven at 350 degrees with half orange juice and half water. Cover with foil and cook for 90 minutes, or until they become soft but still have firmness to them. Warm the heavy cream and stir in the cotija cheese to melt, then set a side for plating. Cut the kumquats in half and cook in boiling water with the piloncillo for 10 minutes. Juice the 150 ml blood orange and whisk in the extra virgin olive oil with crushed garlic and vinegar. Cut the cooked beets into wedges and leave in vinaigrette for 3 hours before serving. 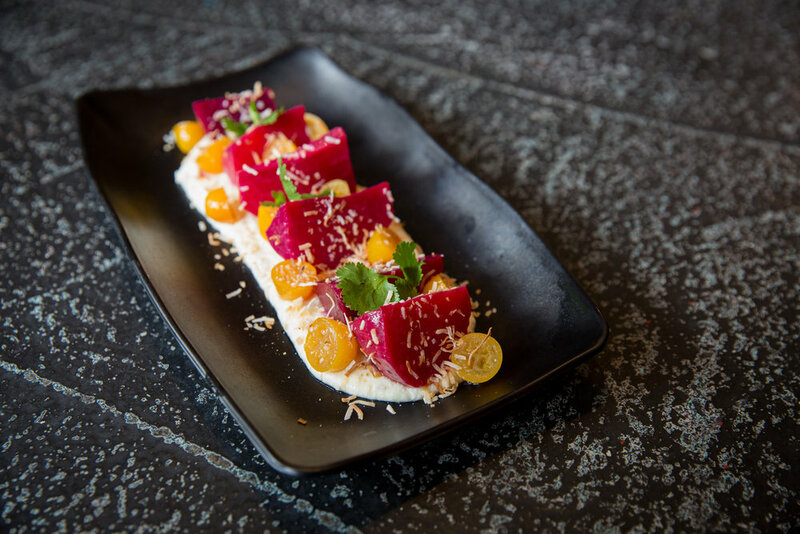 For plating, spread some of the cheese mousse on each plate and place 5–6 wedges of the marinated beets on top. Dress beets lightly with the vinaigrette, then sprinkle plate with the roasted coconut and a pinch of Maldon salt. Place the kumquats along with the beets on the plate. For the final touch, top the salad with 1 tablespoon of the PdH oil and enjoy.